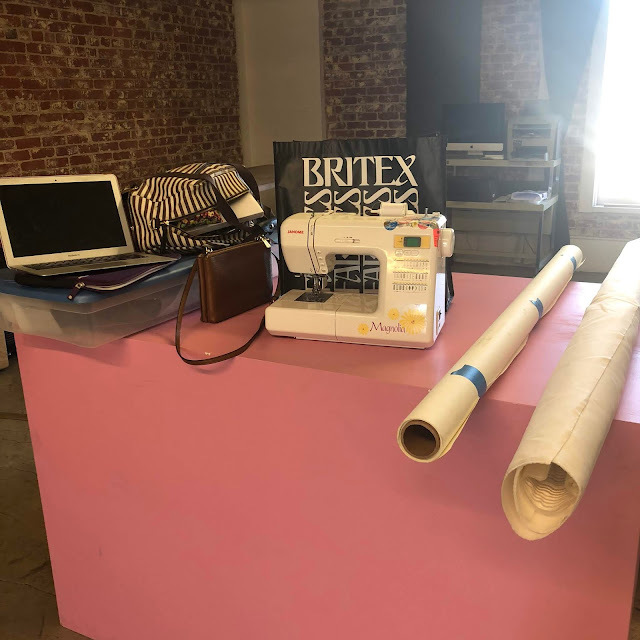 Made By Meg: Wedding Dress Sewing: Making a Dress! Wedding Dress Sewing: Making a Dress! In my wedding dress sewing adventures, I have to admit that I was a bit hesitant to cut into my fabric and start. After months of designing and fitting and testing, it was hard to pull the trigger and say, "I'm ready!" Finally in February, with six months to go until the wedding, I cut in and went for it. In this post, I'll share my construction notes and tips I picked up along the way. During this process, I relied heavily on Alison Smith's Couture Dressmaking Techniques class on Craftsy and Susan Khalje's Bridal Couture book. While I love good old-fashioned internet research, it helps to have a comprehensive guide to the subject. I rented the book from my local library, where you can special-order books from any other library in the state, and bought the Craftsy course during a $20 sale. And then I actually used them. 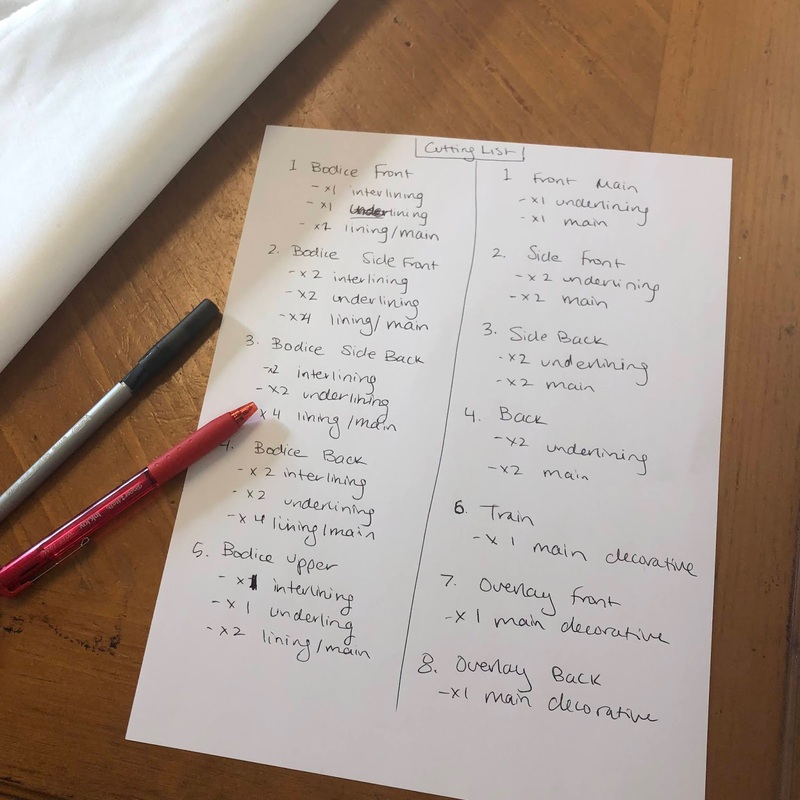 I took notes, saved pictures, and poured through them until I had a comprehensive construction plan for my wedding dress. If you're looking for internet inspiration, I also enjoyed Fit for a Queen, Brooks Ann Camper, and Bridal Sewing Techniques, as well as the adventures of This Blog is Not for You, Crab & Bee, and Poppy Kettle as they made their own dresses. I bought my main dress fabric at Britex in October during their once annual 30% off sale. (While I have occassionally been a Britex blogger, this dress fabric was all purchased by me.) 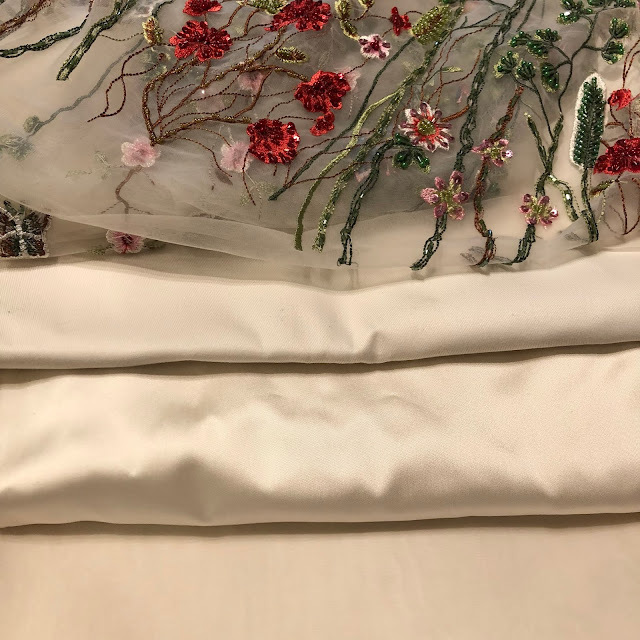 After wandering around the store for a good bit, one of their lovely salespeople took me under her wing and guided me toward the right fabric - a sturdy silk-viscose satin with a good hand and all natural fibers for breathability. She recommended a silk blend to get the benefits of silk but avoid some of the excessive wrinkles. I bought eight yards as well as eight yards of silk organza and was a happy customer. Yarn “floats” give satin its luster but also make it prone to snagging, so be careful of snags when working with and storing the fabric. Buttons can also roughen up buttonholes on silk fabric, so consider placing decorative buttons over a functional snap. The floats also make this fabric directional, so make sure to use a directional layout when cutting. Folds are difficult to remove. For this reason, uncut fabric should be stored on a bolt rather than folded. Cut fabric, as well as the final garment, should be stored carefully. Store inside out to prevent abrasion, soiling, and wrinkling. Satin glazes when pressed without a cloth, so always press from the wrong side with a pressing cloth. I made myself a silk organza pressing cloth from the remnants of my dress, which worked fabulously. I now use it for everything. The fabric can pucker when sewn. For long, vertical seams, consider cutting slightly off grain to prevent puckering. To give the fabric more heft without weighing it down, silk organza underlining can be used to help fill out the folds and pleats of the garment. While I followed most of this advice, like using silk organza underlining and pressing carefully, shamefully my fabric sat (carefully) folded in my closet, so there were a few wrinkles to get out. I did follow the advice about pressing, though, using a silk organza press cloth to carefully press the wrong side of the eight yards of fabric for what seemed like hours. Thankfully, it mostly behaved and the wrinkles pressed out. 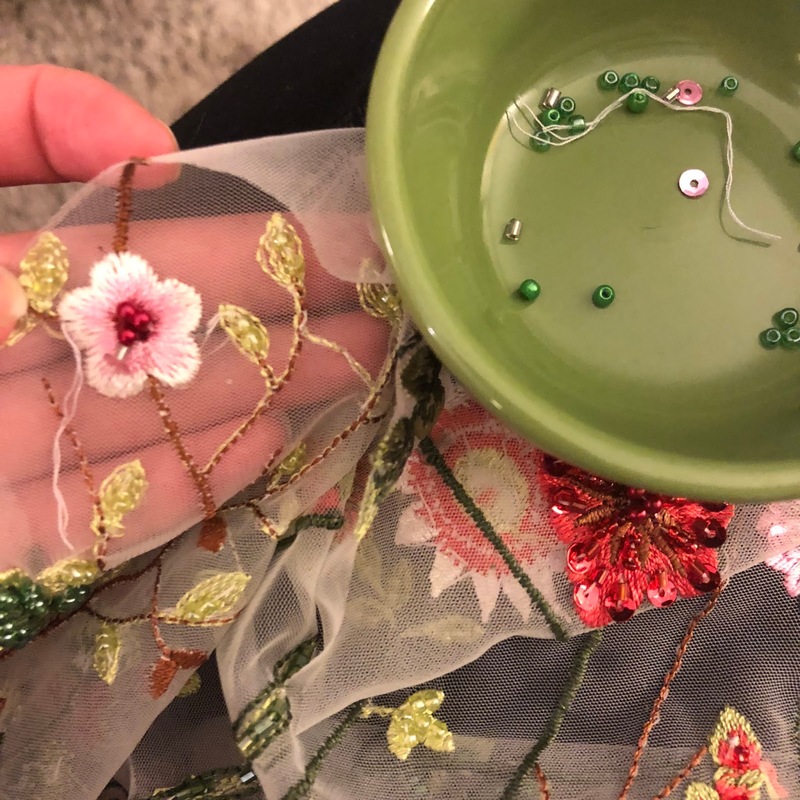 I also ordered a beautiful beaded, embroidered tulle on Etsy. While my local fabric store sold a version of the tulle, I could only find the beaded version online and just had to have it. I'm fancy like that. While the design seemed novel at the time, I have since seen it pop up EVERYWHERE, from new pattern releases to fast fashion ads on Pinterest. Oh well, I think only those who follow fabric trends will feel it's played out by the time they see my dress. Use a faced hem so as not to turn the embellishments in toward the skin. Removing the beading from the seam allowances and tying off all the threads took hours... This was also the most tricky fabric to work with, and required a lot of experimentation to get the right treatment for the seam finishing. I eventually bound all the hems in silk organza bias tape, and used French seams throughout. 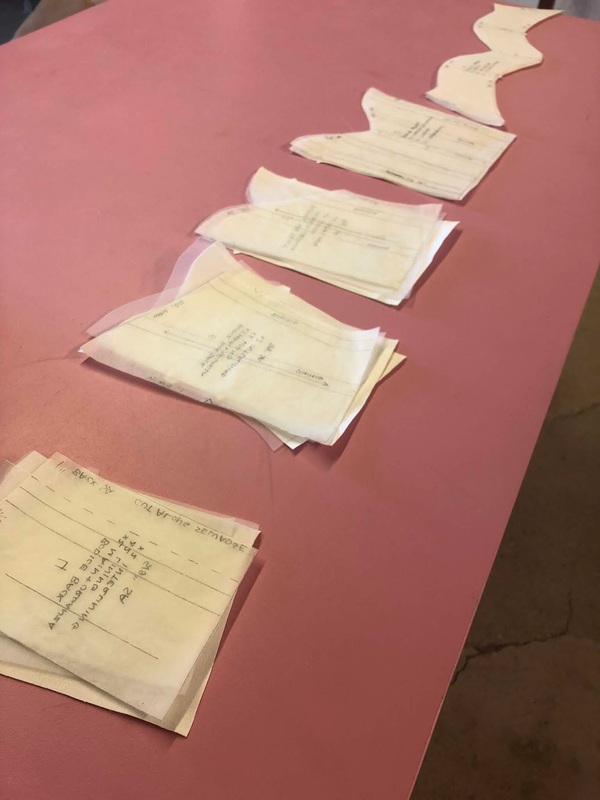 Although I only had four main pattern pieces for the skirt and again for the bodice, after I accounted for the main fabric, tulle overlay, lining, underlining, and, in some cases, interlining, I had close to sixty pieces! So on cutting day, I packed my bag and headed over to my office where I have a large dining room table to cut everything out on. I made a list, put on the radio, and got to work. I think all told it took me about six hours to cut everything out single layer! Cut single layer for accuracy. Cut center back pieces along the selvage for added stability. While pattern matching might not be possible at all seams on the bodice, consider where to strategically pattern match. On my project, I was most concerned about the center back of the bodice overlay, which was made from the embroidered tulle. I was also concerned about key places where I'd need to stabilize the embroidered tulle. I cut the tulle so that the bustle point would be supported by embroidery and could hide any additional stabilizer that might be needed. Because the bodice needs to support a heavy skirt, several layers of underlining might be needed to both provide support and camouflage the boning. Poly-cotton batiste, muslin, crinoline, or even flannel can do the trick, and muslin can be added as an additional underlining. While the bodice would be fully lined, the skirt would not be. This was to keep the skirt as lightweight as possible. 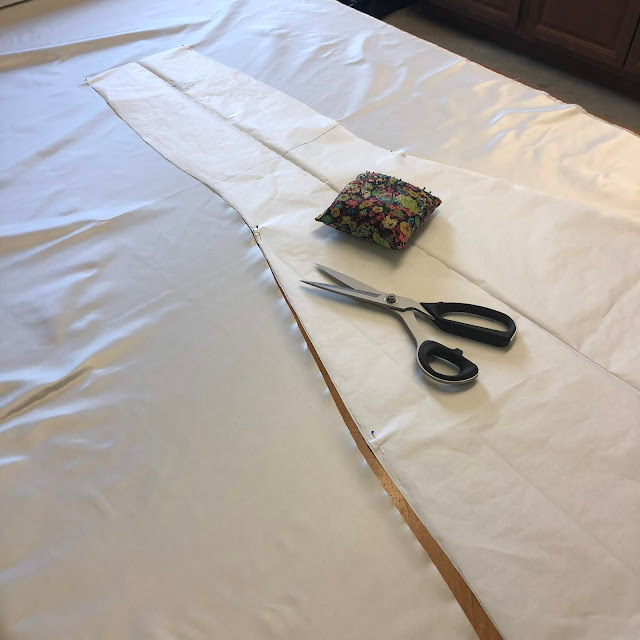 To neatly finish off the seam of the skirt, I cut the underlining bigger than the main fabric and used it to bind the seams using this technique. Listed below, it would almost seem like sewing things together was a quick process. But my actual constructions notes are over four pages long, with details such as how wide to make the French seams in the tulle overlay and how high to hem the skirt off the floor. Again, I highly recommend you check out Susan Khalje's book and Alison Smith's Craftsy course, because this information could really fill volumes. Working on weekends, the entire sewing process took about two and a half months. I first assembled the bodice, which meant sewing up the main fabric (underlined with silk organza), interlining made from muslin, and lining. The boning channels were then attached to the interlining, leaving room at the top and bottom for the seam allowances. I also added bust cups to the interlining. I applied twill tape to the underlining of the main bodice piece along the top seamline of the bodice. This is a technique that Susan Khalje recommends for hugging the bustline close to the body. I then attached the lining and the tulle bodice overlay. The skirt panels were all sewn together and hand-tacked down to the underlining. This required hours of hand sewing. I then attached the bodice to the skirt, and inserted the invisible zipper. After trying out and checking length, I hemmed the skirt with 1" wide horsehair braid. Once the rest of the skirt was hemmed, I finally inserted the tulle insert at the back of the train. Finally, I added some finishing touches like the bustle point and a beaded trim at the waist. There was lots of experimentation, deep breaths, and hand sewing in between. Next week I'll preview my progress, and what it feels like to be in the murky middle! you are so organized. Don't you feel that all your sewing knowledge you have gained in the past 10 years is bringing you to this point? Fantastic and can't wait to see the next post. I have the same Magnolia, and it's such an awesome machine! looking forward to reading the next installment. Wow, I'm so impressed! Can't wait to see the final result! Cannot wait to see what's next!